At address Dustin looks primed and ready to go. His feet alignment is a bit open but his shoulders are pretty square. He has a strong left hand grip. From the setup position you can sense he’s going to hit it long. 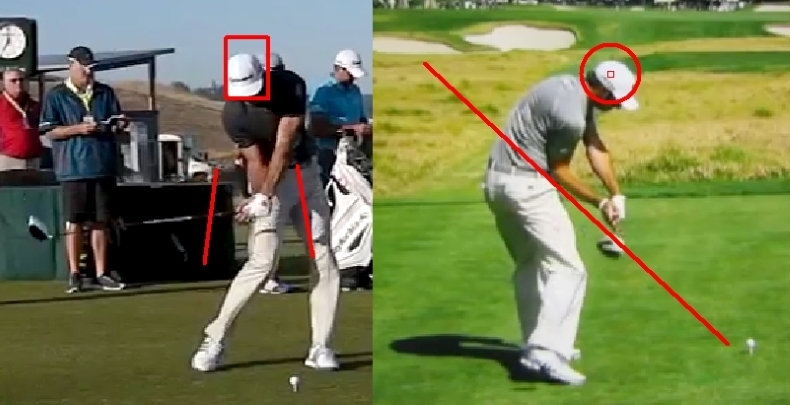 As Dustin continues to move the club away you can see he moves it outside the original shaft plane and he pushes his hands out a long way from his body. 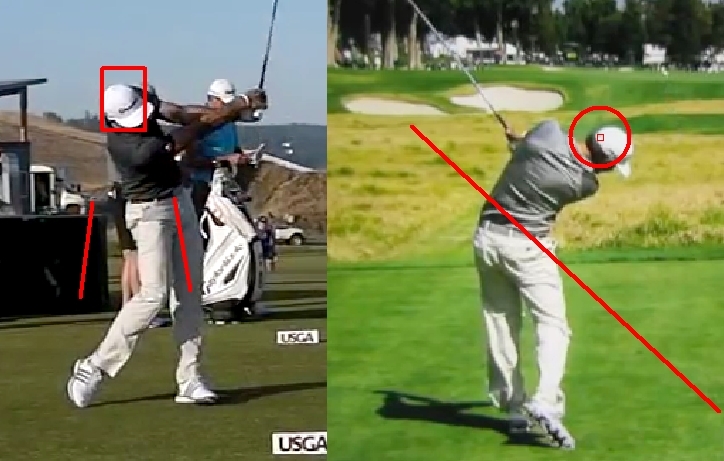 From the face on view it’s clear to see how quickly he uses his wrists to move the club away. So his take-away is very wristy and outside the original plane. When the club is parallel with the ground in his backswing you can see the clubface is very shut and he is starting to bow the left wrist. The club is above the plane line as you can see from the picture below on the right. 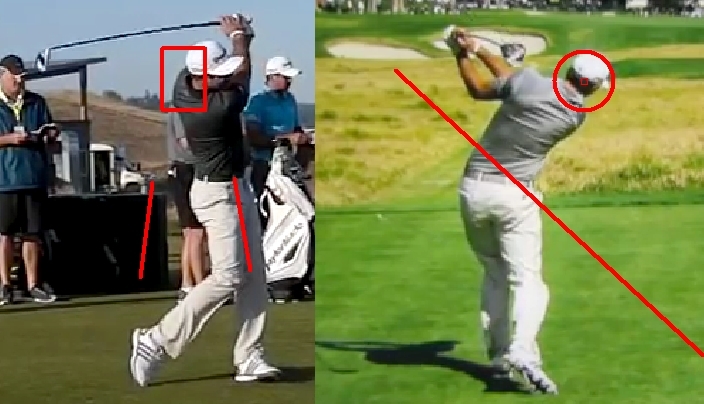 At the half-way point in Dustin’s backswing his club is quite flat and the clubface is very shut. That’s from the down the line view. From the front on view it looks great. Wow, what a long swing! Look at how those hands are. Look at how bowed that left wrist is. It makes my wrist hurt just looking at that. And look at how far past parallel that club is. 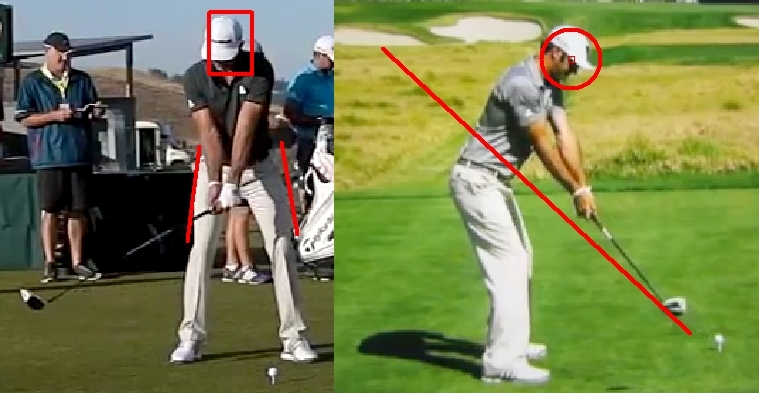 One interesting thing Dustin does in his backswing is to keep his left hip in a similar place to where it was at address (although it’s turned a lot). 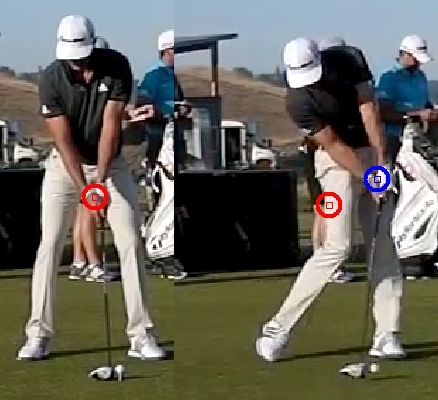 He does not have a lot of weight on his right side at the top of backswing and his head has stayed centered, although it’s lower that it was at address. 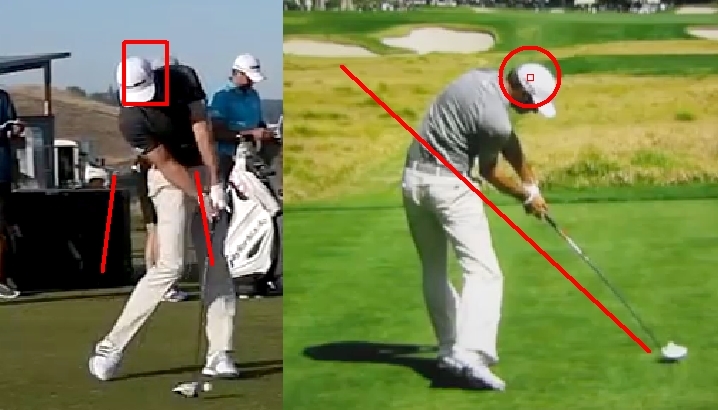 In the downswing Dustin has flattened the shaft nicely. The clubface is very, very shut at this point. If he didn’t use his body to rotate hard through the ball he would hit the biggest hooks you’ve ever seen. This is a great position. Everything looks great here, although the club is still closed, but more on that in a second. Impact, the moment of truth. 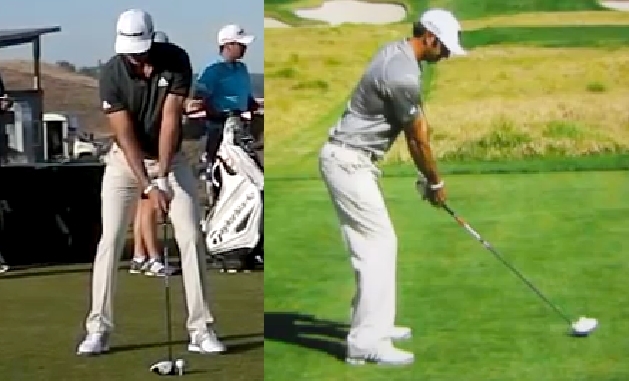 Dustin has a lot of forward shaft lean at impact. Do you remember when TaylorMade had an advertising campaign about “lofting up”? 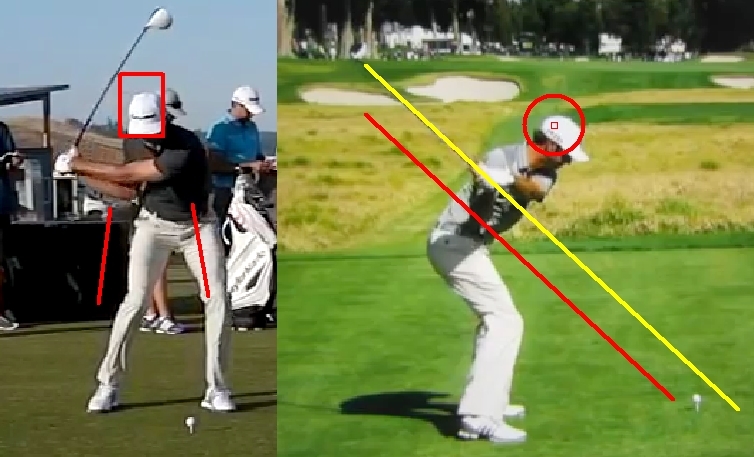 Well, Dustin uses an 11 degree driver and it’s very clear why he needs such a high lofted driver! Look at how far Dustin’s hands are in front of where they were at setup. That ball is coming out low and hot! No wonder he uses an 11 degree driver, even with all of his swing speed. Now if you see Dustin’s drives on protracer on T.V. you’ll see he hits a lot of shots that start left and then fade. It’s pretty clear how he does this. The ball starts left because his clubface is closed to his final finishing target. Then his swing path would be a bit out-to-in. That would mean the clubface although appearing to be closed will actually be a fraction open to the swing path. From that point above Dustin lets the clubface release through. When you watch Dustin swing at full speed it looks as though he collapses in the follow-through. You can’t see that yet however, because at this point in his follow-through it’s looking solid. From that point above Dustin flips the club so it is very flat. He definitely does NOT have a high finish to his golf swing, which is kind of odd. Here’s the end of Dustin’s golf swing and it’s very flat. No high hand finish here. But hey, who cares, the ball has well and truly gone 300+ yards down the fairway! So that’s an analysis of Dustin’s golf swing. He’s got some odd stuff going on there, but it works for him undoubtedly. He is clearly such a gifted athlete that he’s going to kill the ball no matter what. 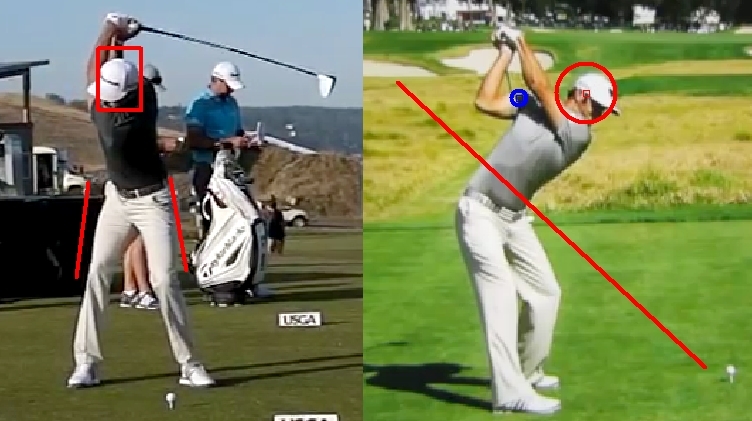 What can the average golfer take away by looking at Dustin swing? I think the big key thing is that you don’t have to have a picture perfect golf swing to play great golf. You can do some things in your golf swing that are unique to you. What matters at the end of the day is impact. 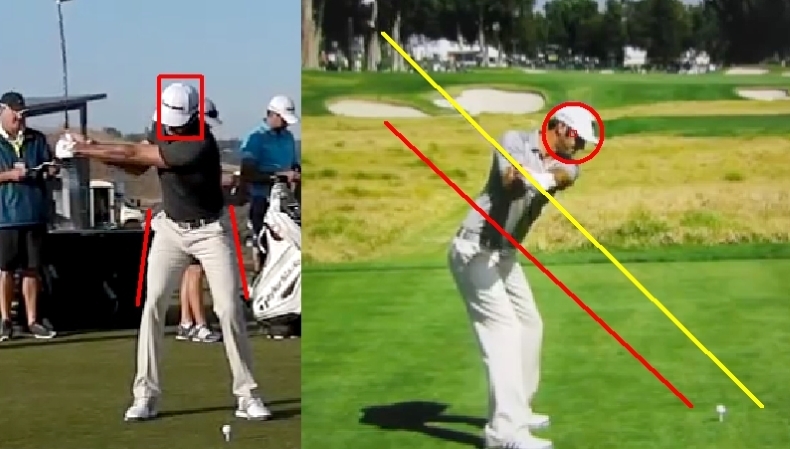 If you can repeat a good impact position then you’ll get good results. 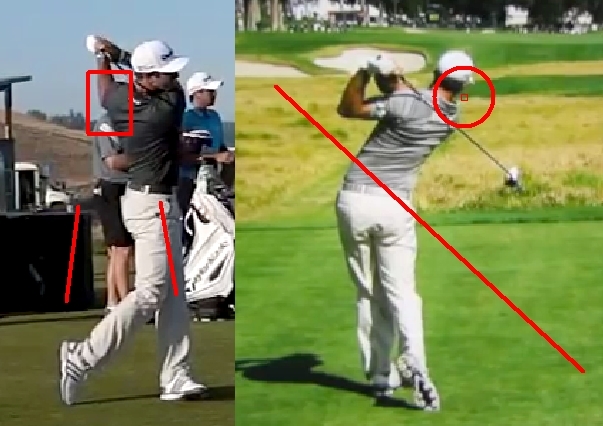 But I think the glue that keeps Dustin’s swing together is his swing plane. He swings down flatter than he swings back. That is one of the biggest things to his success with his unique swing. Because if he swung down steeper than he swung back then you would have never heard of him. 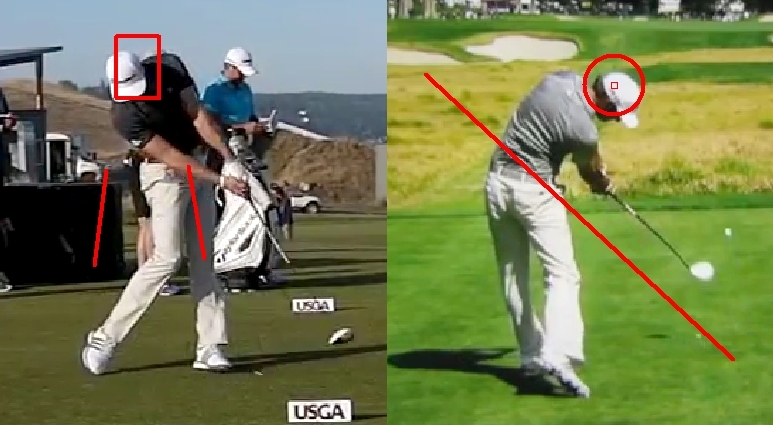 Most amateur golfers swing down steeper than they swing back which is a killer move. 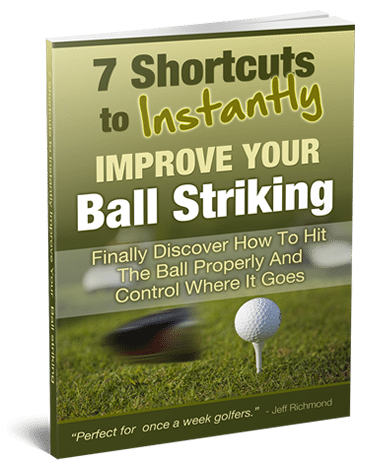 "Which One Of These 7 Shortcuts Will Instantly Improve Your Ball Striking?" Get Instant Access to this FREE report. Shortcut#1: Discover Ben Hogan's secret for hitting the sweet spot consistently. Shortcut #2: The cure for fat shots. Shortcut #3: The key to a successful golf swing. 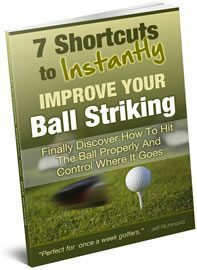 Shortcut #4: How to hit one shot - consistently. Shortcut #5: Improve your consistency by doing this. Shortcut #6: The real way to play one shot at a time. Shortcut #7: Ben Hogan's secret to low scores. We hate spam too and will keep your email address private.